For Variety‘s first Contenders issue of the year, I profiled four early scores that could be vying for “original score” honors as the 2017 awards season gets underway: Dario Marianelli’s music for Darkest Hour; Thomas Newman’s music for Victoria & Abdul; Carter Burwell’s music for Wonderstruck; and Rupert Gregson-Williams’ music for Wonder Woman. This is just the beginning, of course — there will be other stories about composers and songwriters during November and December, as the season progresses. This entry was posted in Composers, Film Music, Interviews and tagged Carter Burwell, Dario Marianelli, Darkest Hour, Oscar music, Rupert Gregson-Williams, Thomas Newman, Variety, Victoria & Abdul, Wonder Woman, Wonderstruck on October 31, 2017 by Jon Burlingame. 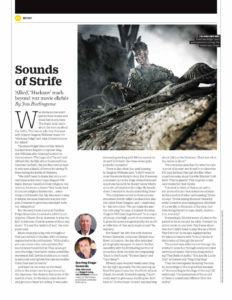 The third of my four stories in this week’s special issue of Variety deals with the music for this year’s big war movies, Hacksaw Ridge and Allied. 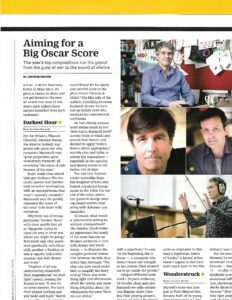 I interviewed Rupert Gregson-Williams about working with Mel Gibson on the music of Hacksaw Ridge, and Alan Silvestri about Allied, his 16th feature film with director Robert Zemeckis. Both were illuminating, as the composers talked about going beyond the old war-movie cliches and finding new ways to illustrate, or deepen, the stories with music. This entry was posted in Composers, Film Music, Interviews and tagged Alan Silvestri, Allied, Hacksaw Ridge, music for war films, Rupert Gregson-Williams, Variety, war movie scores on December 4, 2016 by Jon Burlingame. 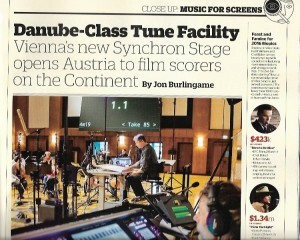 This entry was posted in Composers, Film Music, Interviews, Television Music and tagged Hans Zimmer, Inferno, Music for Screens, Netflix, Rupert Gregson-Williams, Synchron Stage, The Crown, Umlaut Audio, Variety, Vienna recording on April 29, 2016 by Jon Burlingame.